JEAN RENO (LEON, RONIN, 22 BULLETS) plays a veteran thief specialising in grand scale heists in this slick, densely plotted thriller, which twists and turns right up until its dramatic finale. 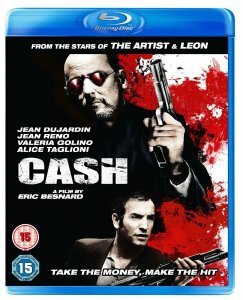 Maxime (Jean Reno) has joined forces with CASH (Jean Dujardin) as part of a new crew set upon pulling off the robbery of a lifetime. They operate in a manner that relies as much on calculating mind games as it does muscle. Often impossible to tell who is, and who isn't on the right side of the law. The group falls into chaos when it is revealed that one of them has been working as an undercover police officer and is looking to shut down the operation from the inside. Beautifully shot on the streets of Paris, CASH has rightly drawn comparisons to Oceans Eleven and Twelve, but stands alone in providing a fresh, dynamic heist thriller that will keep audiences guessing throughout.